When I was looking for a Kerala style side dish for appam apart from vegetable stew, I got to know about this Kerala style tomato curry recipe / thakkali curry with coconut milk. It is an yummy side dish for appam, dosa and rice. This is the first time Iam making tomato curry with readymade coconut milk powder. I used Maggi coconut milk powder to make thin coconut milk and used in this recipe. Tomato curry came out very tasty and tasted more like kurma with mild masala flavor. Raksha and myself loved it with appam and dosa. 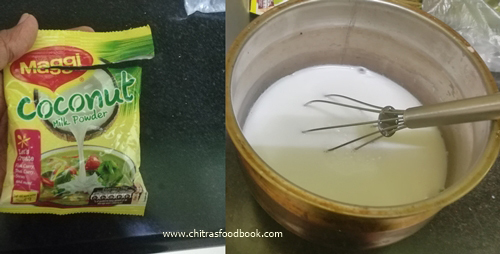 I tried this recipe after watching few YouTube videos. In the video, this curry was prepared for rice. But I had it with appam and dosa. Hope it tastes good for idiyappam too. Friends, if you love tomato based side dish recipes, you must give this a try. You will love it for sure. Ok, lets check how to make Kerala style tomato curry for rice, appam with step by step pictures. Check out my Potato paya recipe, Vegetable stew recipes too. 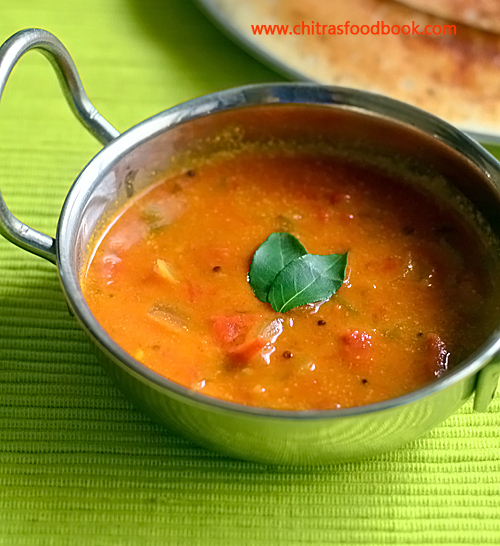 Kerala style tomato curry recipe with onion, tomato and coconut milk. Green chilli - 2 nos. Ripe tomato - 2 nos. Wash and chop onion, tomato into small pieces. Take Maggi coconut milk powder packet. Follow the instructions and make thin coconut milk. Heat oil in a kadai. Splutter mustard seeds, curry leaves. Saute onion, green chilli and tomato. Add salt, spice powders and saute well. Lastly add the coconut milk. Boil for few minutes. Garnish with coriander leaves. Serve with rice, appam or dosa. Tastes yummy ! Take the readymade coconut milk powder. Add water as per the instructions given on the pack. I added 3 tbsp of water for 1 tbsp of powder. Make 1 cup of coconut milk and set aside. Heat coconut oil in a kadai. Splutter mustard seeds, curry leaves. Saute onion and green chilli till onion becomes transparent. Add tomato pieces, salt and saute till tomato becomes mushy. Add turmeric powder, red chilli powder and coriander powder. Mix well till raw smell goes off. Lastly add the coconut milk and boil the gravy for few minutes till it reaches the desired consistency. Switch off the flame and garnish with coriander leaves. Serve hot with rice, appam or dosa. Adjust the quantity of spice powders and green chilli as per your taste. Add more coconut milk if you wish. 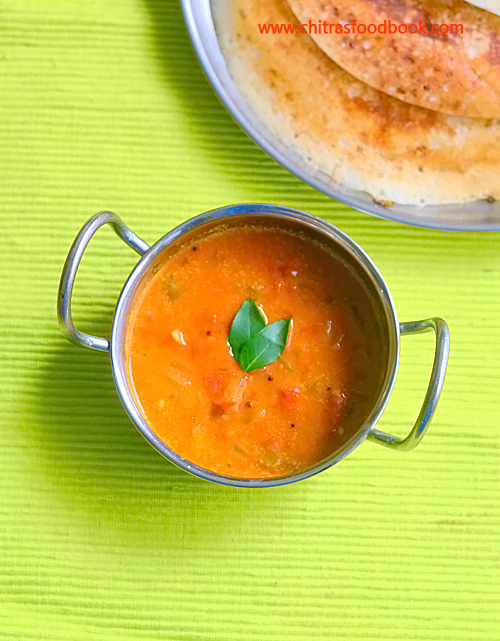 This tomato gravy tastes tangy if you don’t add the required amount of chilli and spice powders. 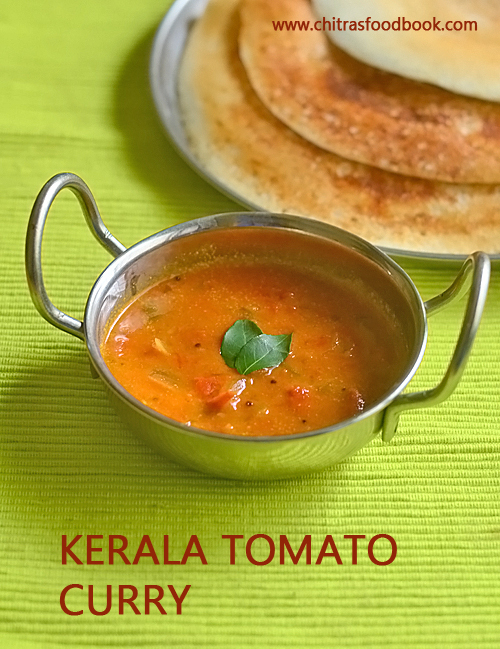 Try this yummy Kerala style tomato curry and enjoy with rice or appam !